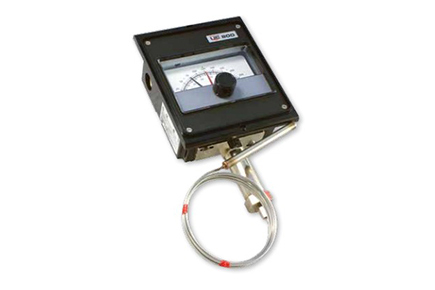 ABLE are exclusive representatives for the United Electric (UE) 800 Series Temperature Gauge, which offers a readable four inch indication scale for applications that require a visual display of process temperature and set point. The 800 series is available in 2 versions: a Lexan window and epoxy-coated aluminum enclosure for Div. 1 explosion proof applications and with a Lexan enclosure for enclosure type 1 or 4 applications (with option M300). For indication of temperature only, the T800 thermometer incorporates the same construction and performance features of the UE 800 Series.